This is a soup with a more gruesome name than the dish actually is. 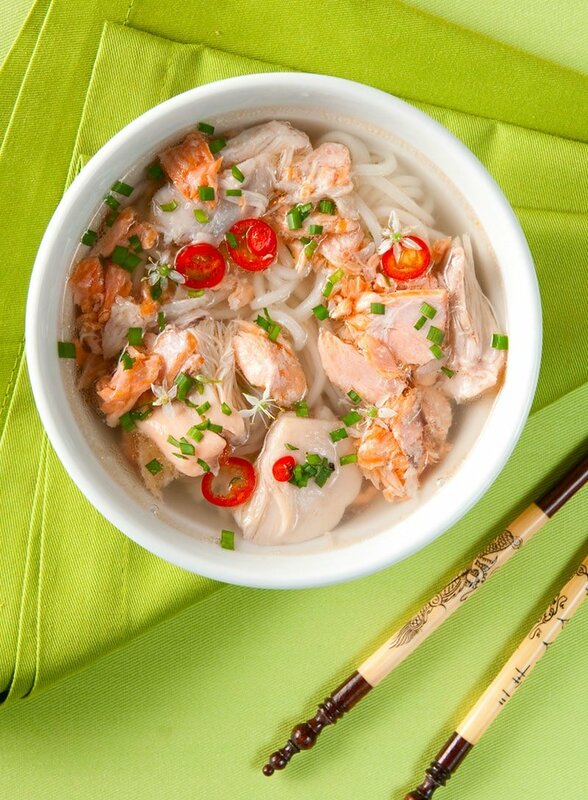 Yes, you use salmon heads to made the broth, and yes, the meat in the soup is from the head, but there are no eyeballs, bones or jaws floating around. It is actually a refined, Japanese-style miso soup with noodles. It doesn’t even take very long to make, and this soup is so, so satisfying. You’ll never toss those fish heads again. 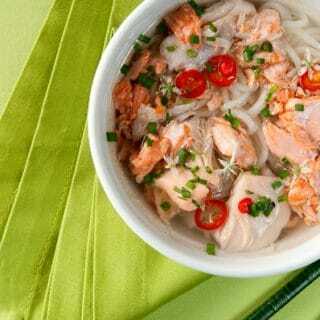 Salmon heads make this a luxurious broth — it’s the fat — and while you can use the heads of other fish like striped bass or lingcod, it would be more austere. Feel free to fool around with it. Trout and char are a perfect substitute. You will need some Japanese ingredients to make this dish, but they are not terribly hard to find. Easy, actually, if you have an Asian community near you. Return the broth to a clean pot and add the mirin. Heat but do not let boil. Add the soy sauce. If the broth still needs salt, add salt -- not more soy sauce, as that will make the broth too dark. You’ll find dozens more recipes for salmon and trout here on Hunter Angler Gardener Cook! 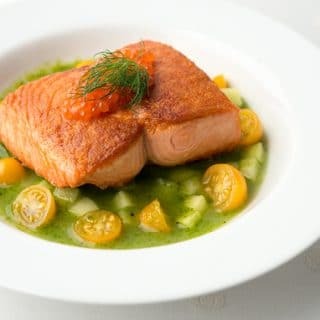 Hank said that salmon has a strong flavor and wouldn’t make a good seafood stock compared to sea bass and other fish. I used a salmon head that i caught fresh here in Alaska and wanted to point out that *freshly caught* salmon lacks a fishy flavor. salmon that has been frozen for several weeks or sat in the fridge for days on ice tends to get fishy. I was out of konbu (also spelled kombu) when i made this recipe. The konbu I added a day later had a far “fishier” flavor than the salmon head! Fortunately, I love konbu. If bothered by the fishy flavor, it’s milder if you use fresh ginger in the broth. I’ve been making this one for years. My kids love it and start to ask for it when I haven’t made it for a while. I usually split the salmon heads with a cleaver to help render them. I also add just a drizzle of sesame oil to the broth when adding the mirin and ponzu. Sooo good! This is one of the more delicious things I’ve made recently. And for you Hank, it’s pretty dang simple (read easy and quick). While I love your recipes, and rely on them for almost all of my fish and game cooking, I definitely plan a lot of kitchen time before embarking on a new one. I’ll second Aaron’s comment about freshly caught salmon not having a terribly fishy flavor. But, I will also say that I’ve been using frozen heads for this recipe (the soup may not be “gruesome”, but opening up my freezer has been an alarming experience for some), and I haven’t noticed too much of a difference in quality between fresh and frozen. I did remove the gills and spinal gunk before freezing, so maybe that helped. Thanks for the recipe. Your right, I definitely won’t be throwing out those heads anymore. In fact I’m now a bit of a vulture, lying in wait while others clean their fish, hoping to glean their unwanted salmon heads! I’ve been making this for years without knowing it’s roots. I normally add heaps of garlic in mine along with the other ingredients, it turns into a delicious and energizing fare. Will try with noodles next time.